Untouched corduroy, calling to you to tear it up. Pristine powder that’s yearning for your skis to run through. Groomers that you can rip down again and again. Tracked up powder that’s not quite ready to fall into the crud category. You’ll ski it all because skiing is skiing whether you’re faced with an icy sheath, the mapped-out groomers or the best powder dump you could ask for. 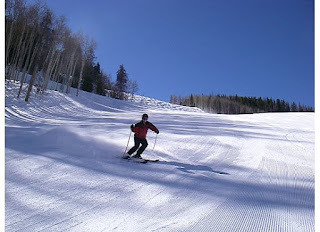 But if corduroy (aka smooth terrain) and powder were to face off, does one offer a tougher workout than the other? That's what this exercise nerd thinks about when she can't go skiing--and when she sees pictures of smooth corduroy begging for her skis to take some quick, fast slalom turns, or the powder shots that everyone else is taking and posting to Facebook. It's a way to get my mind on skiing, but off the fact that I'm not out there (sigh). But what's interesting is the lack of concrete research to support which terrain reigns supreme. Do you have to work harder to ski powder or groomers? I took a look at the perks of each in this latest post at buzz.snow.com. So what's your take? Is it powder or corduroy that gives your the greater workout?